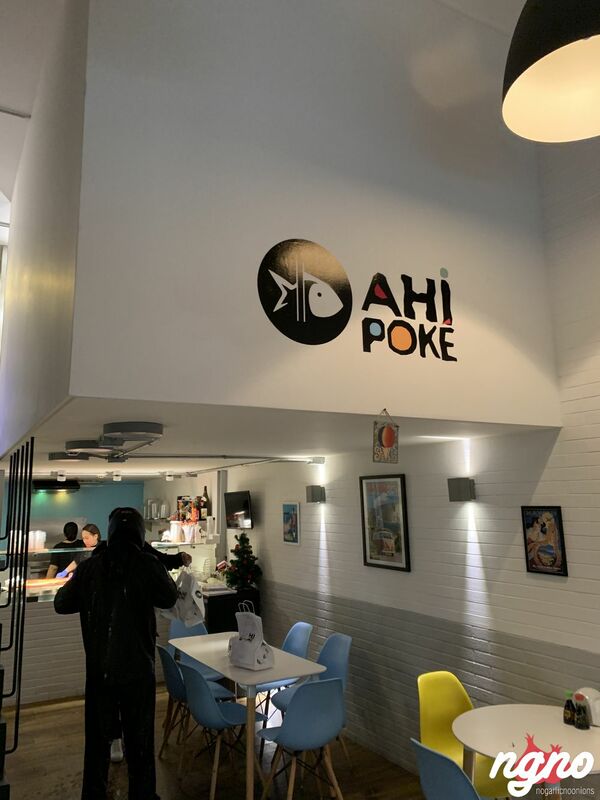 You know by now that I’m a fan of Poke! 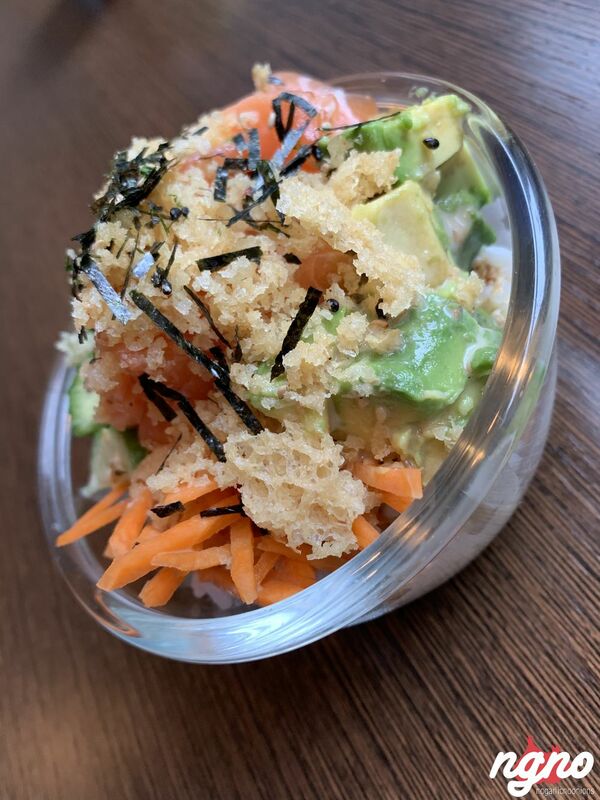 I love it how the rice is topped with fresh ingredients, ready to be mixed like a salad, or enjoyed the way you want them individually. 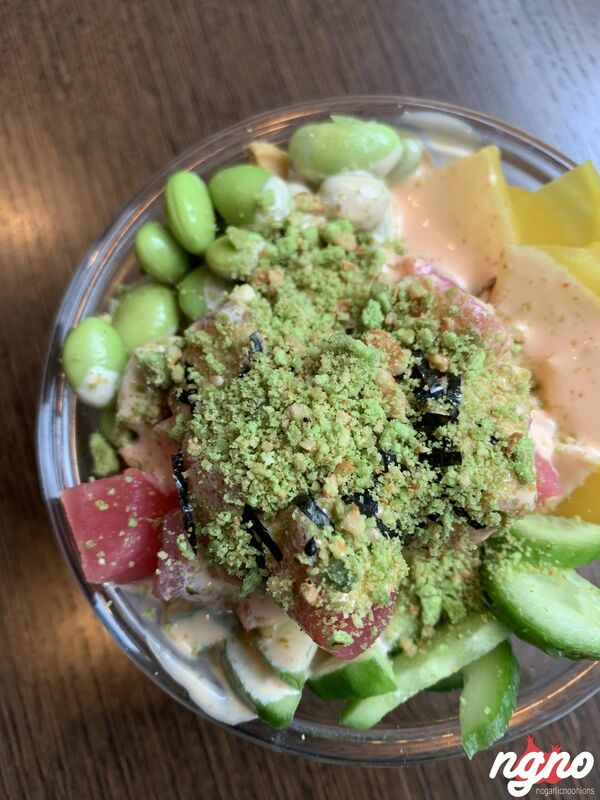 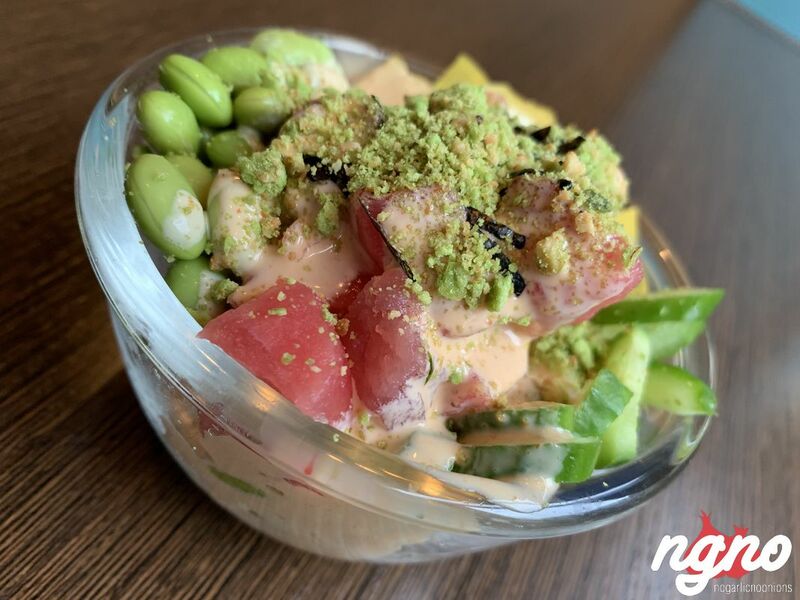 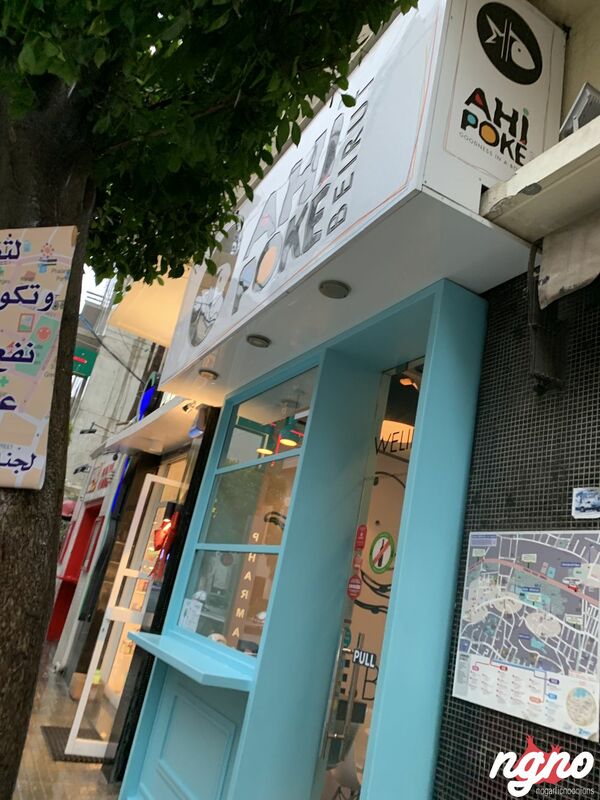 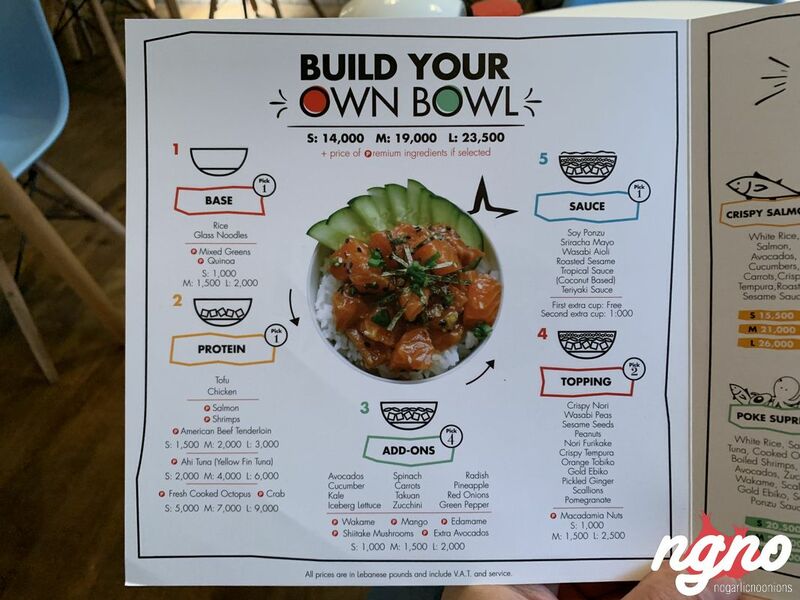 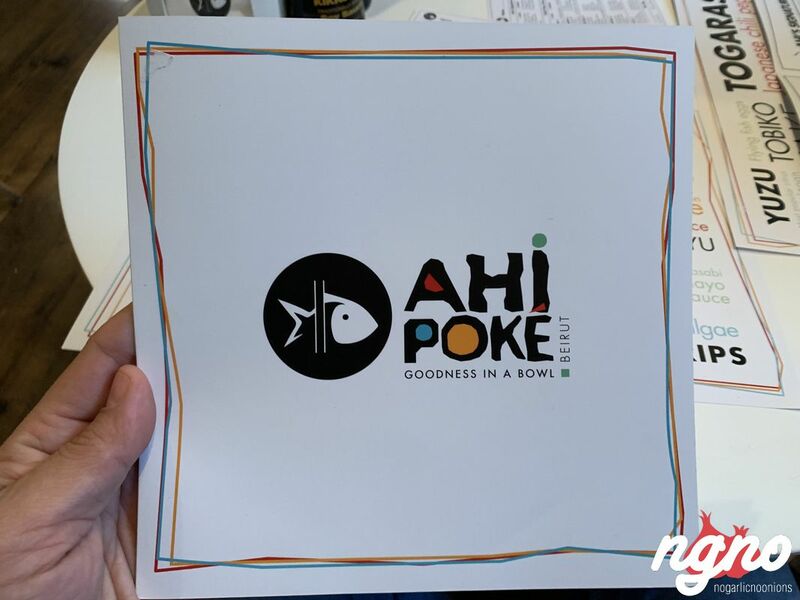 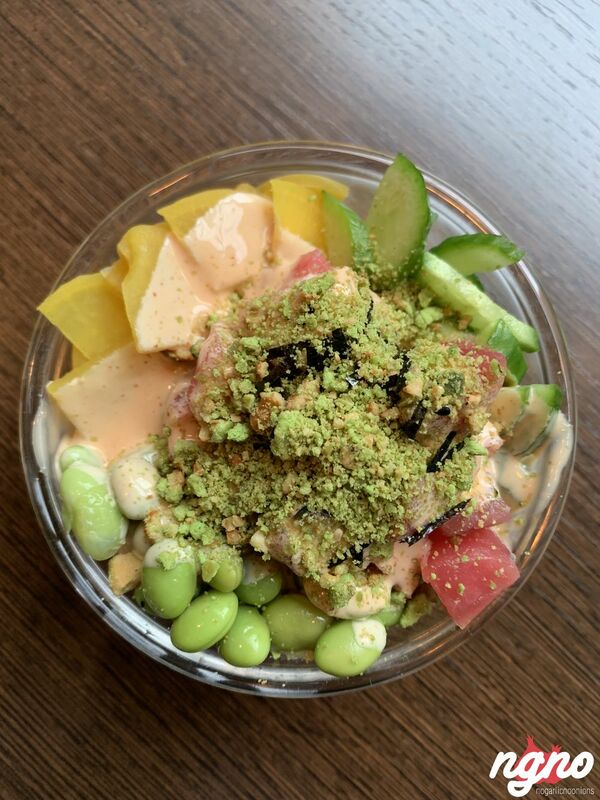 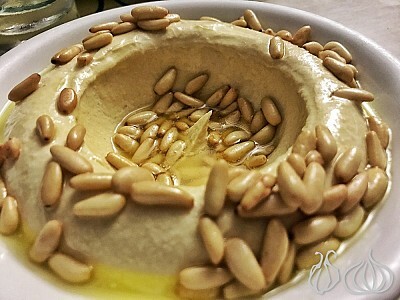 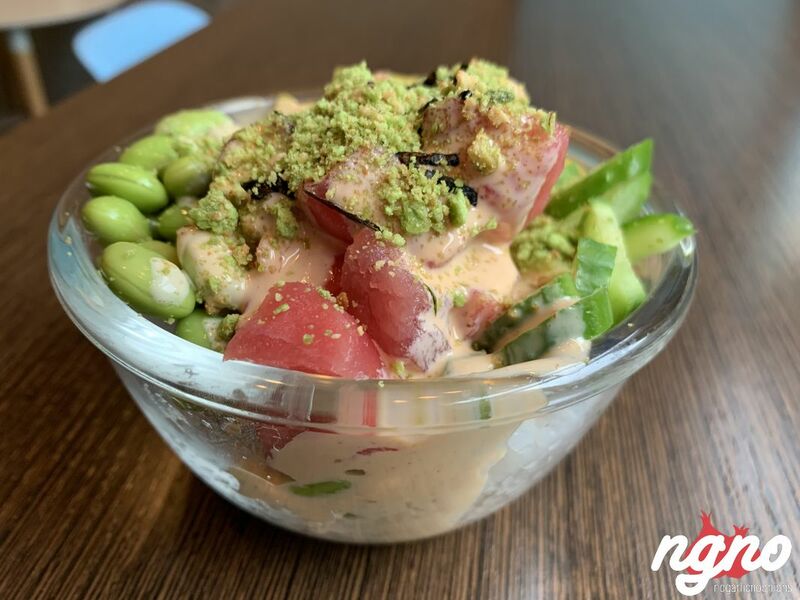 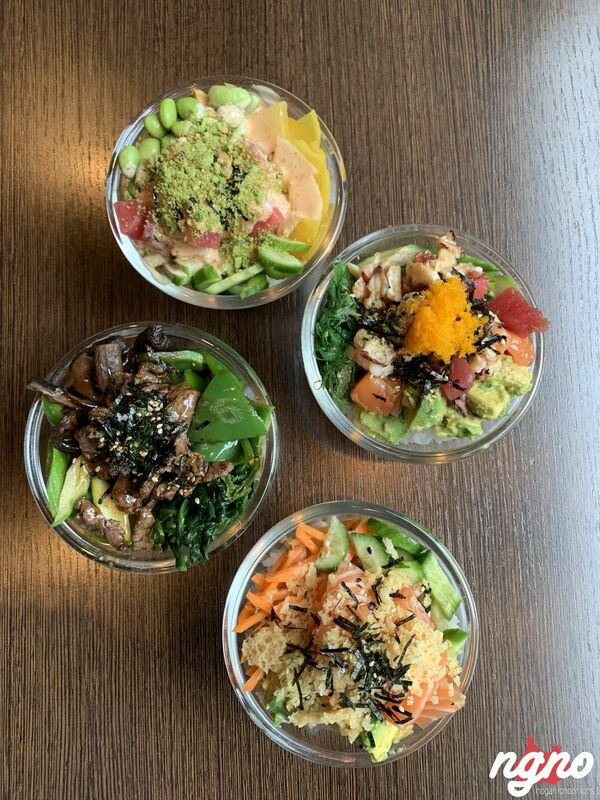 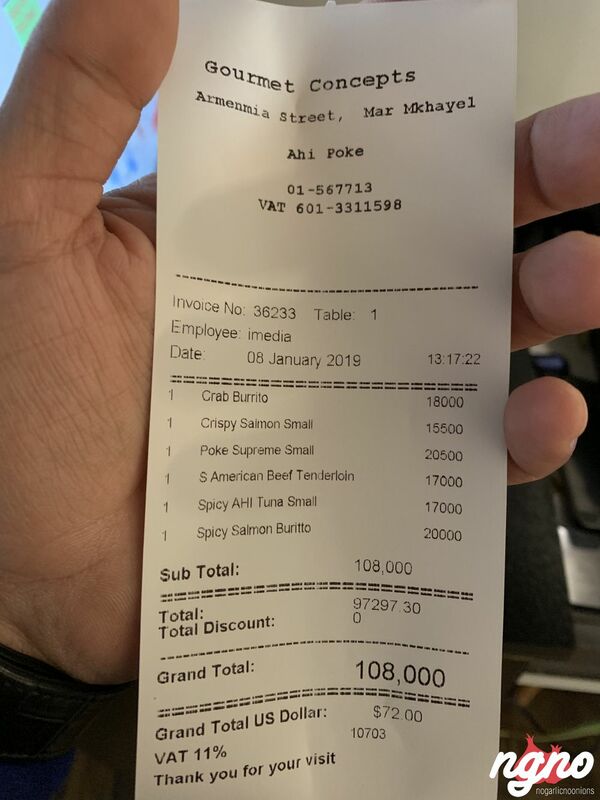 On Mar Mikhael street there’s a Poke destination which I delivered from once, and now was time to dine-in! 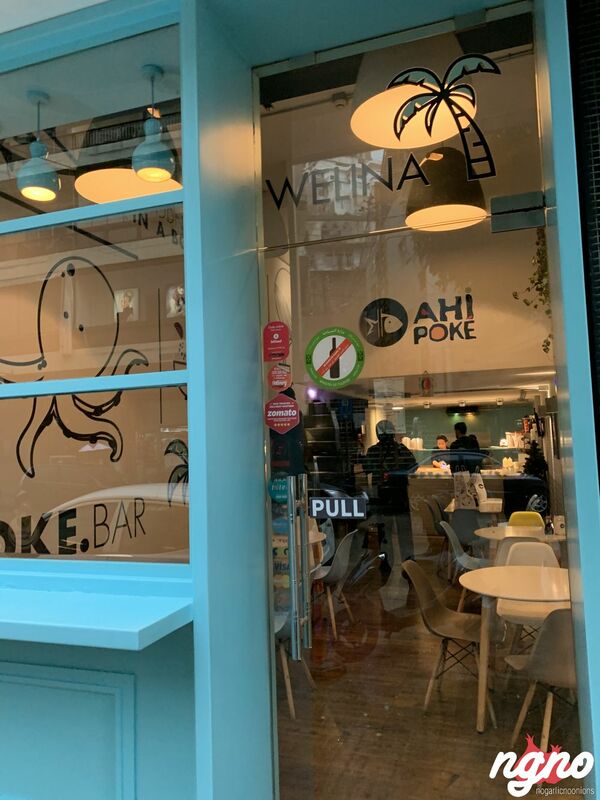 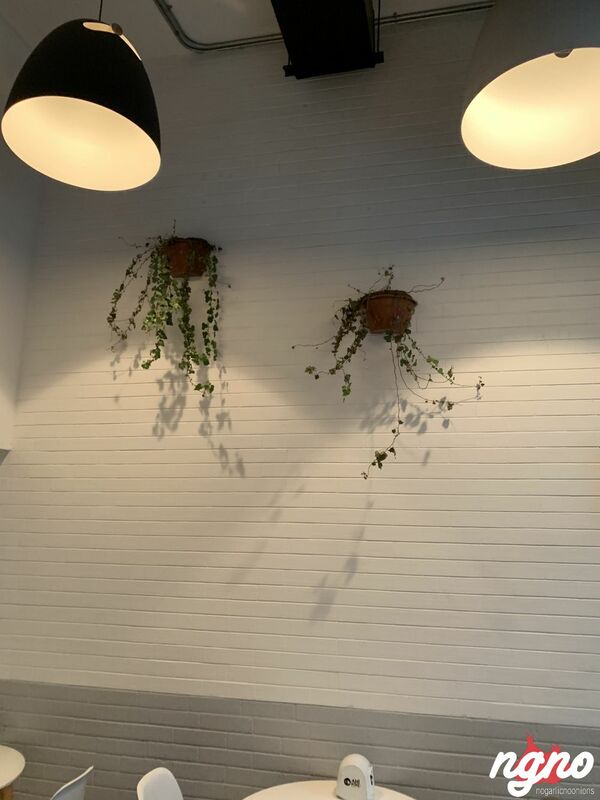 A small eatery, calm and cozy, welcomes you for a quick lunch. 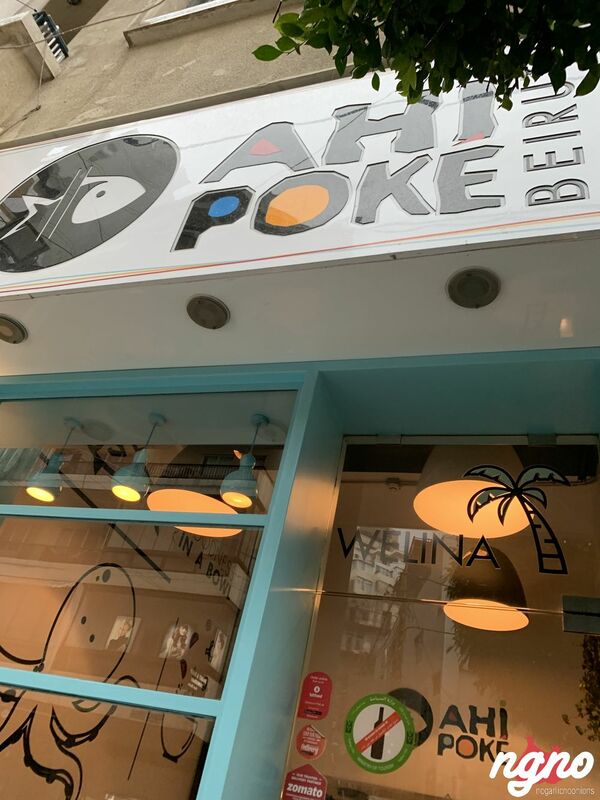 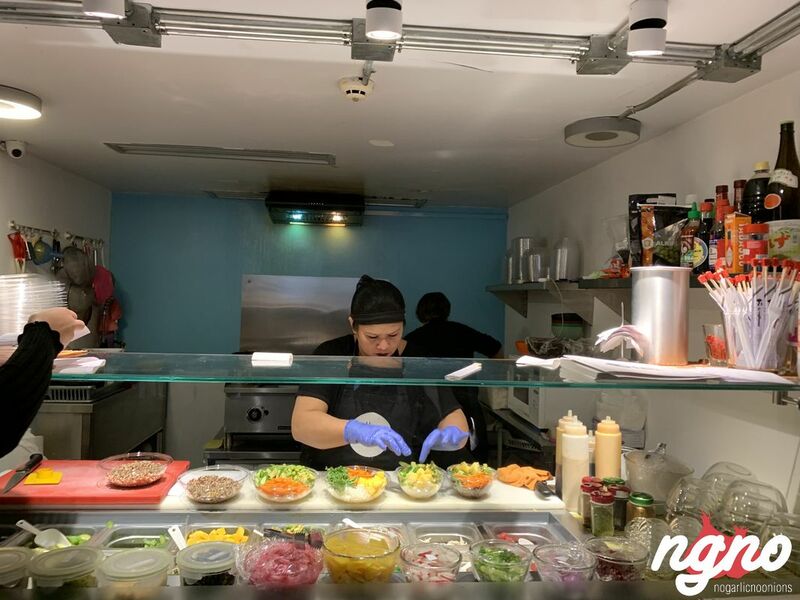 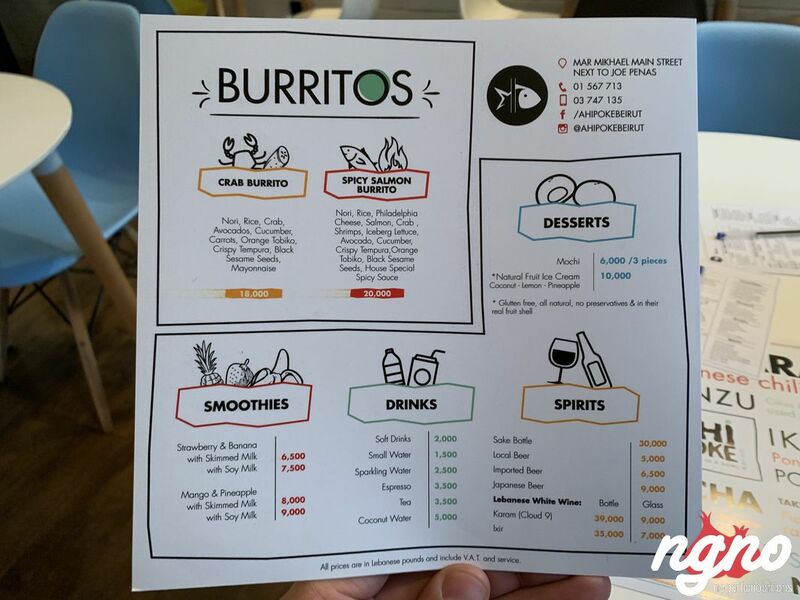 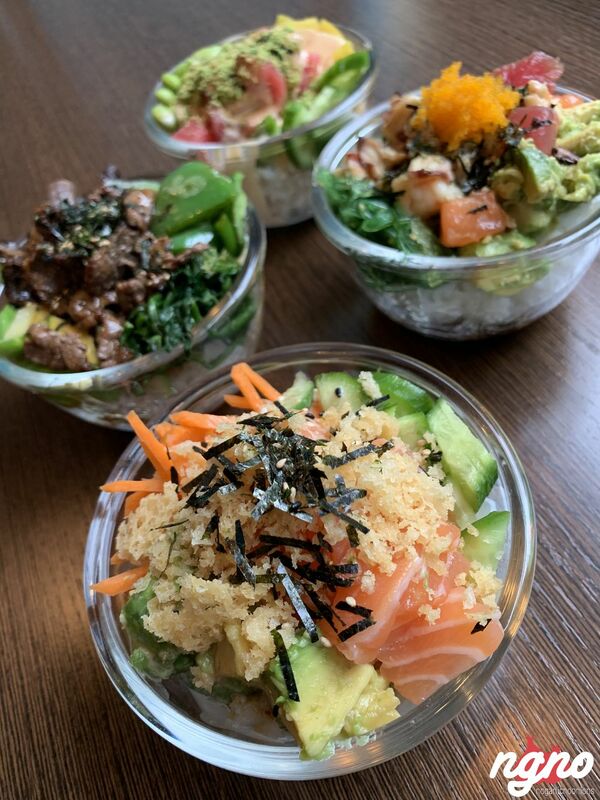 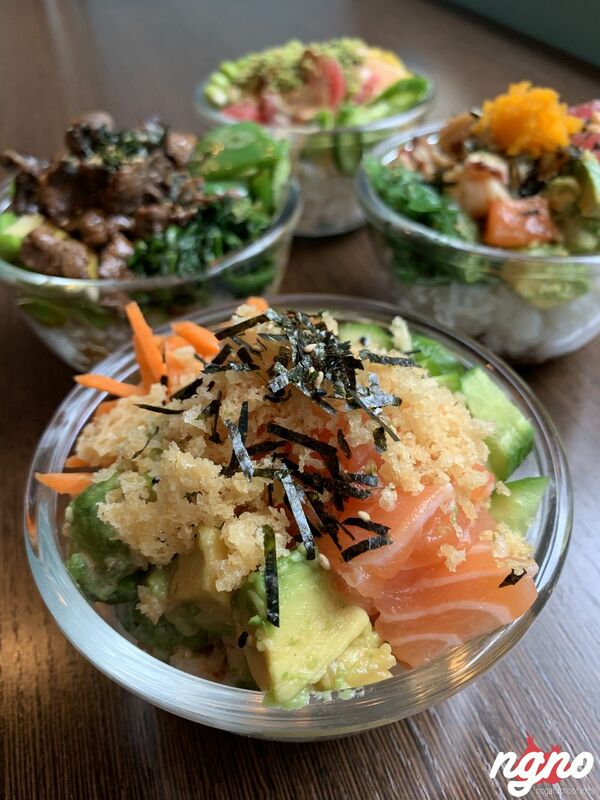 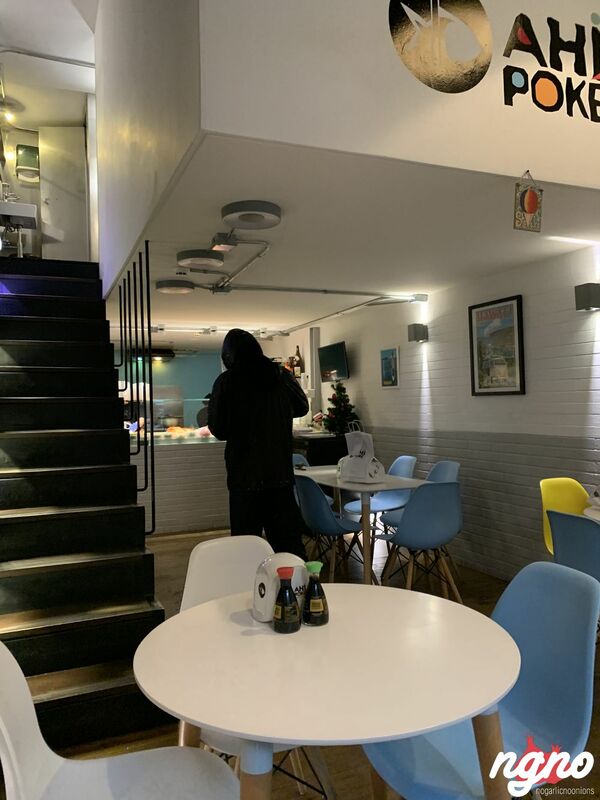 Ten choices of poke bowls and two burritos, the available choices are what you need to satisfy your cravings. 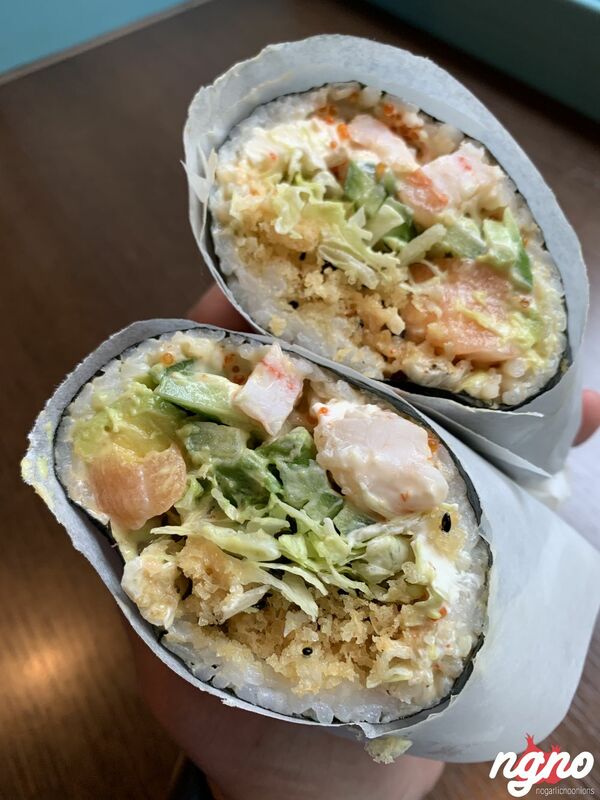 Salmon, tuna, crab or shrimp; meat lovers have a wrap of their own as well. 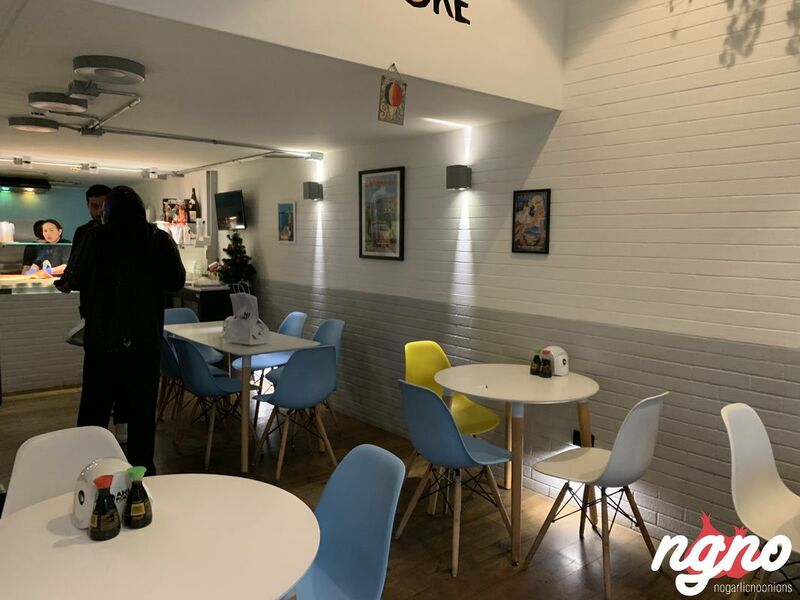 Walls covered with bricks are painted in white and grey, a floor made of wood, white tables surrounded by blue chairs and the open kitchen occupying the end of the restaurant. 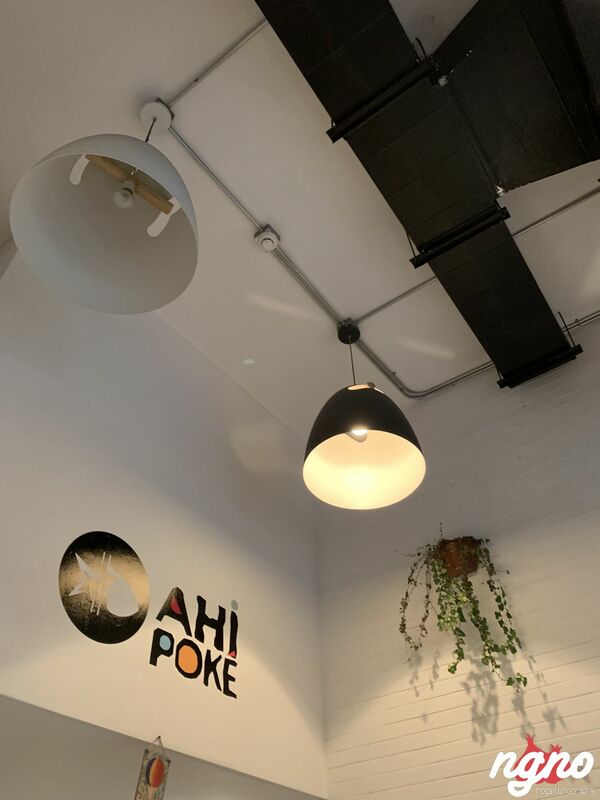 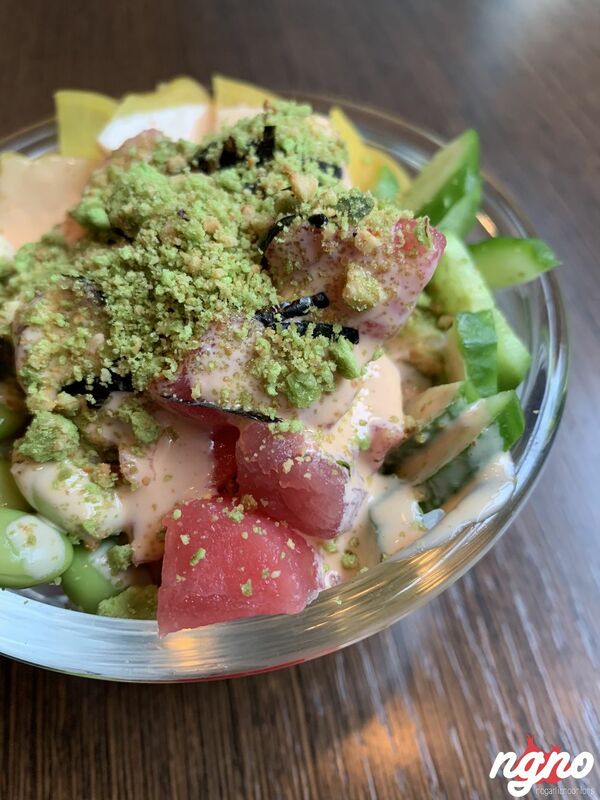 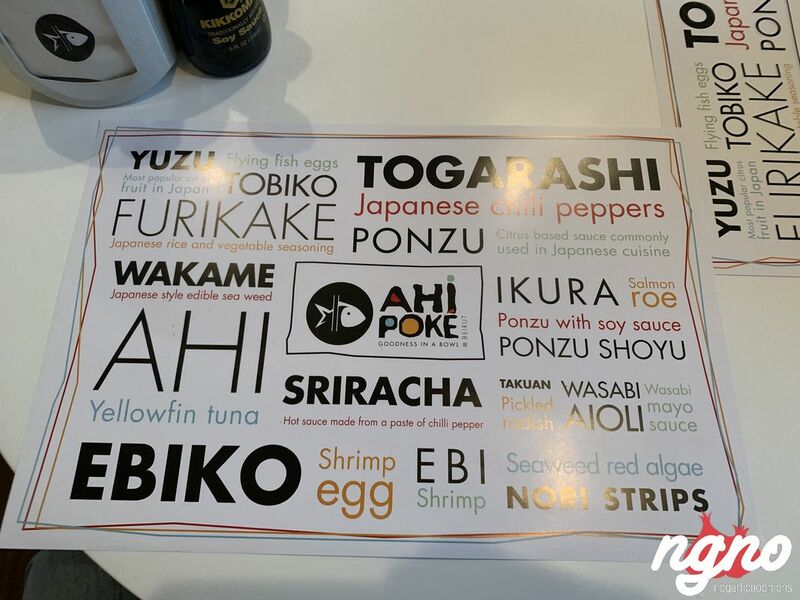 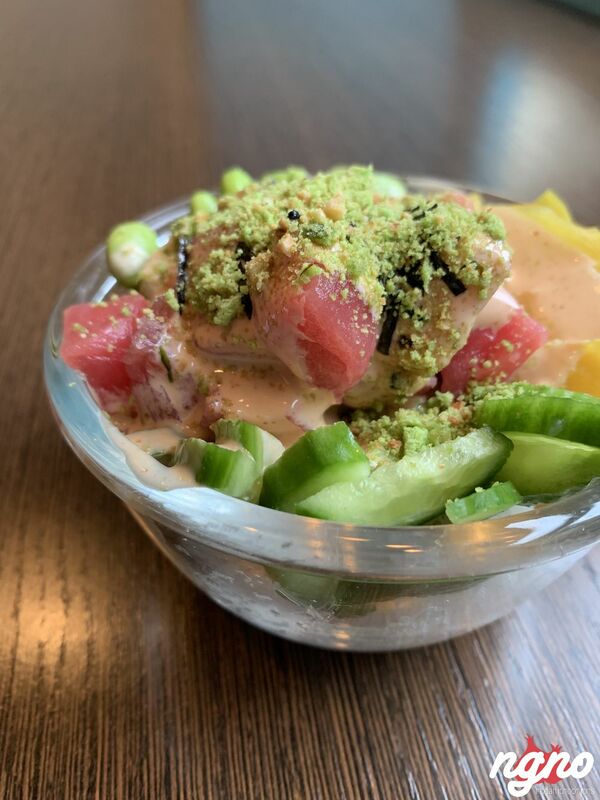 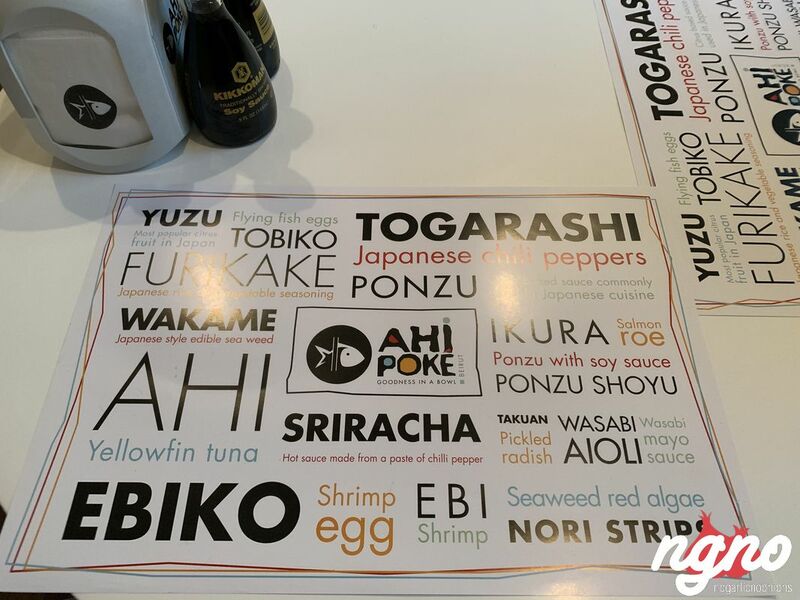 Ahi Poke works mainly on delivery, but dining in is a pleasant experience as well. 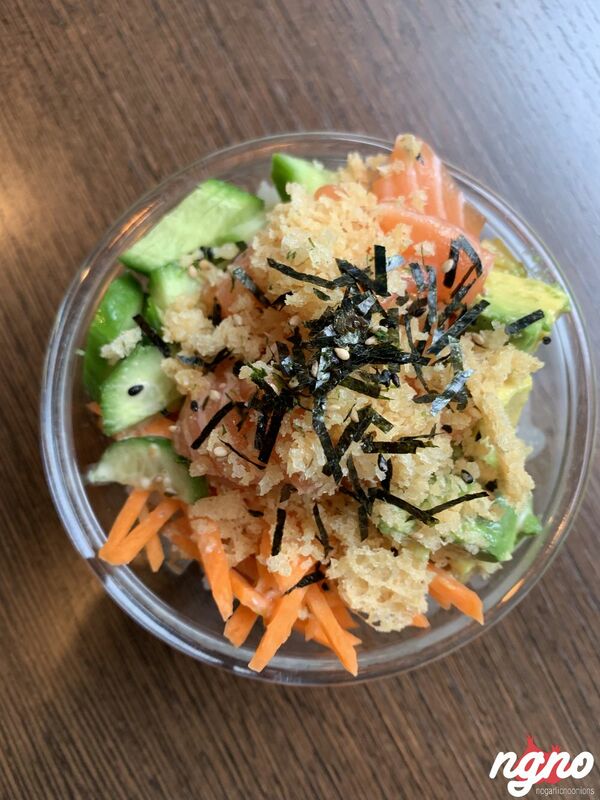 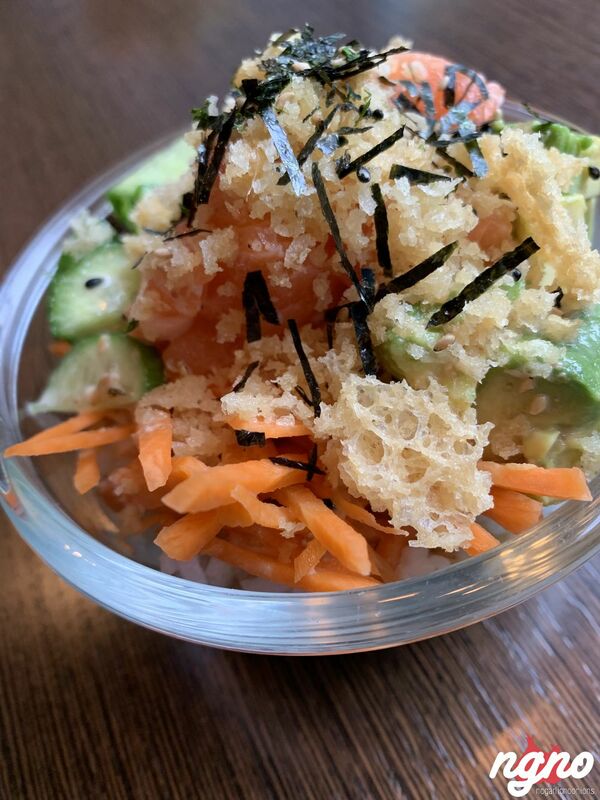 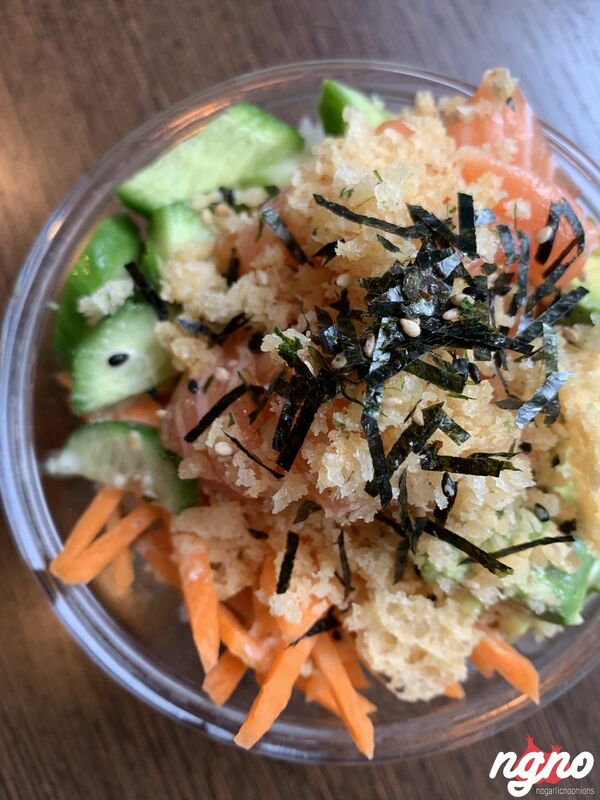 Crispy salmon: white rice, salmon, avocados, cucumbers, carrots, crispy tempura, roasted sesame, and sesame sauce. 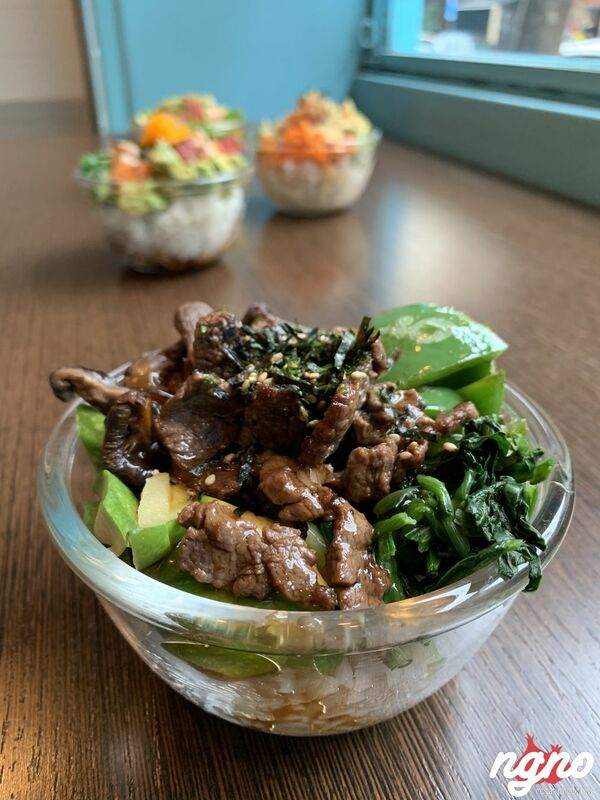 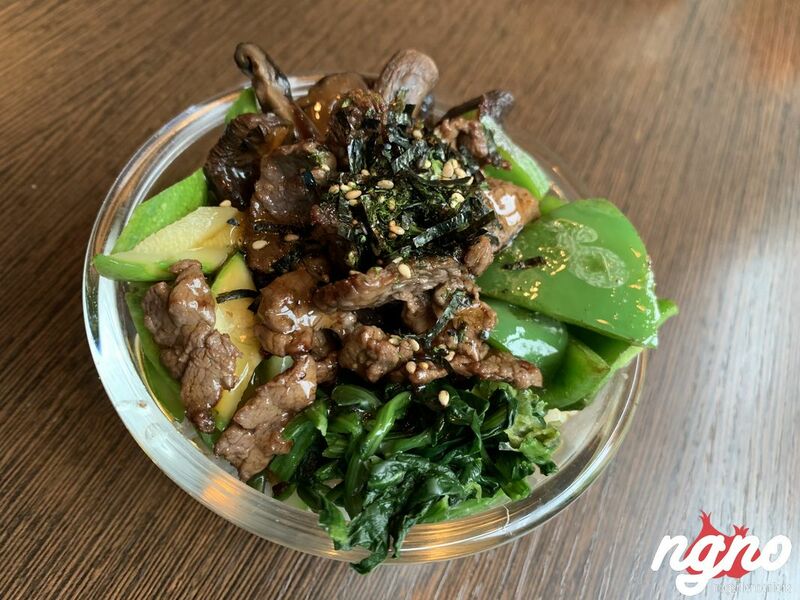 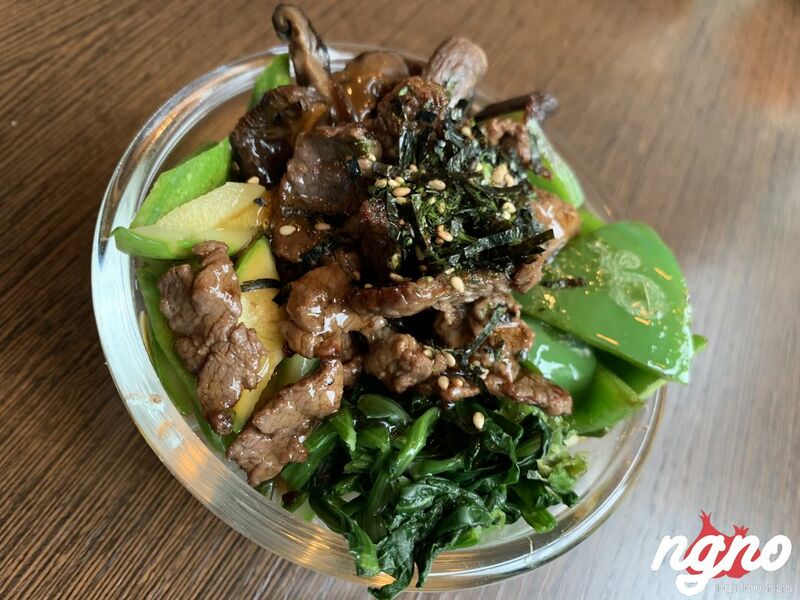 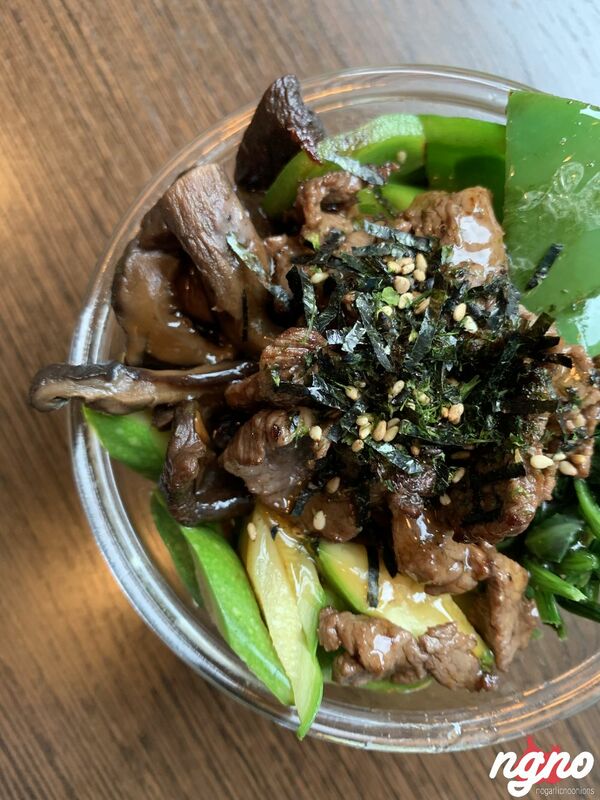 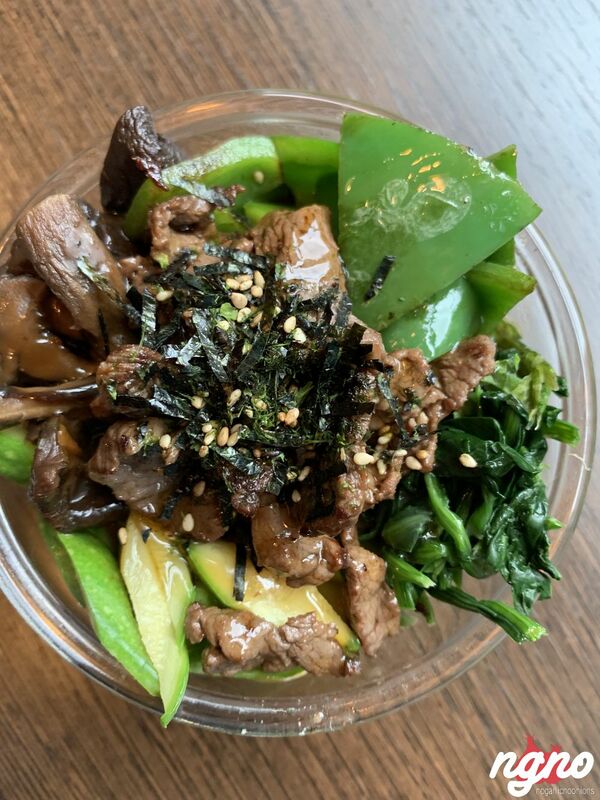 American beef tenderloin: steamed rice, American beef tenderloin, shiitake mushrooms, zucchini, green peppers, spinach, sesame seeds, teriyaki sauce. 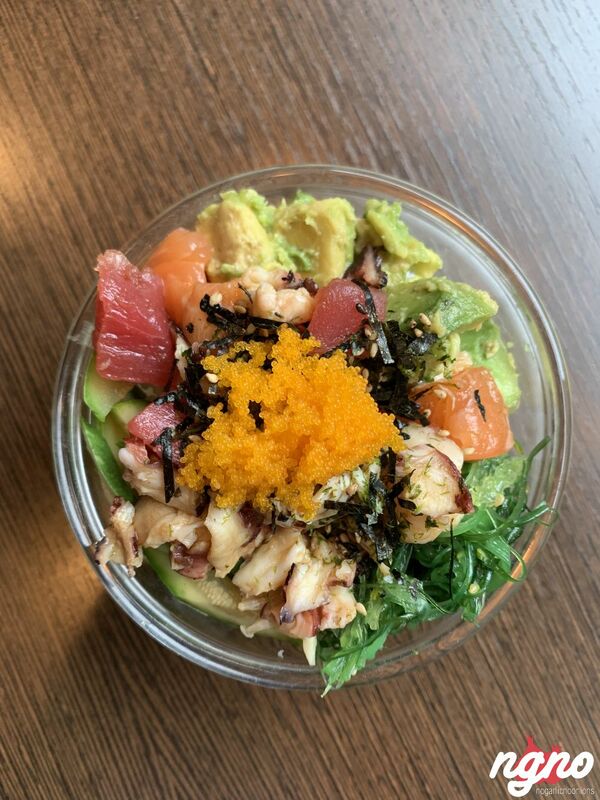 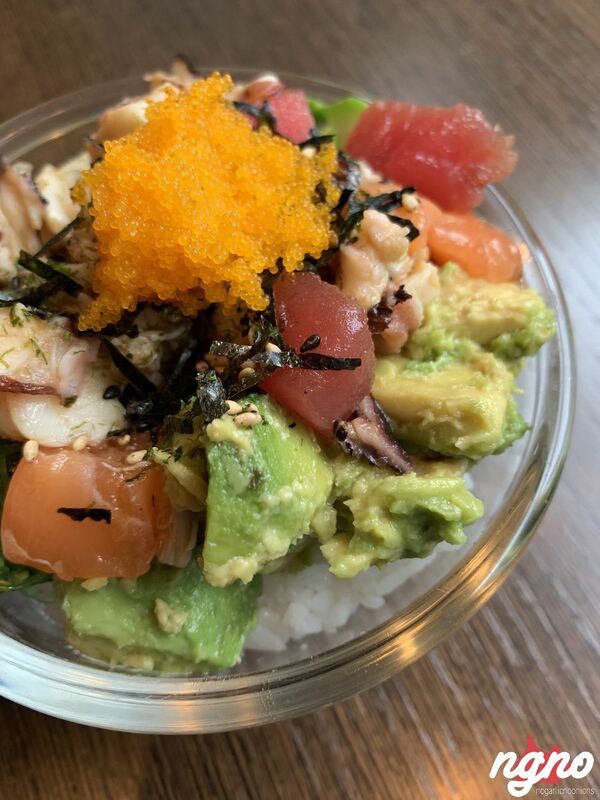 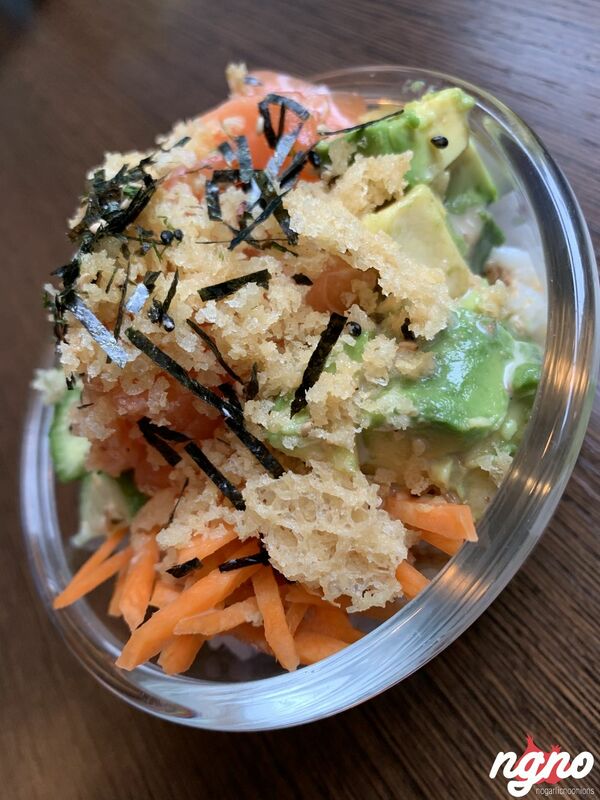 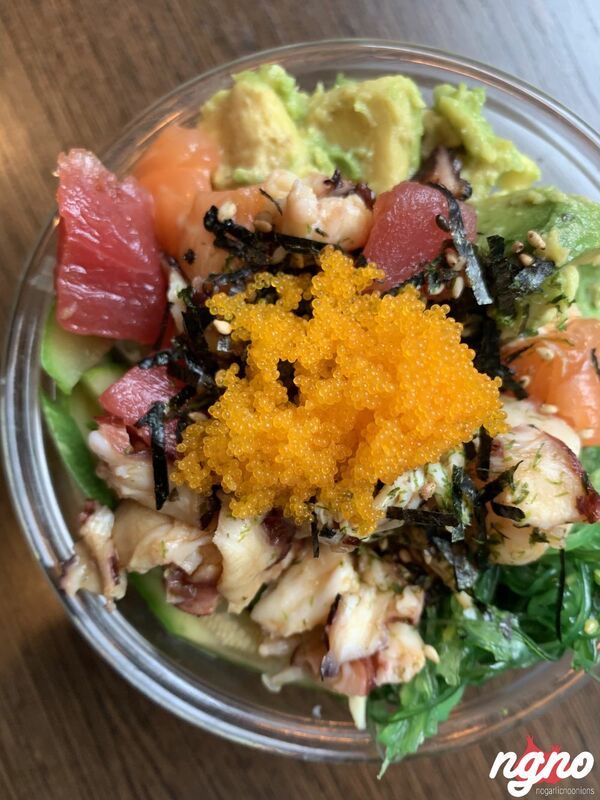 Poke supreme: white rice, salmon, tuna, cooked octopus, boiled shrimp, crab, avocados, zucchini, wakame, gold ebiko, soya ponzu sauce. 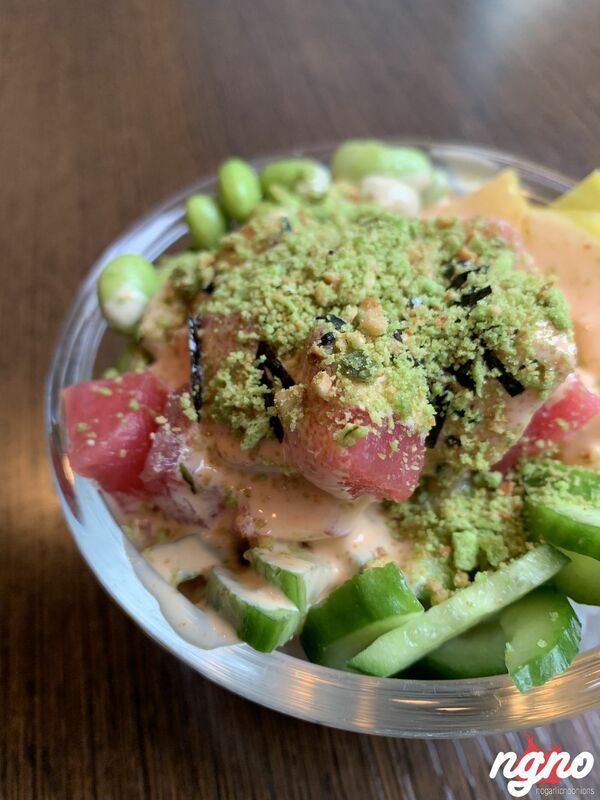 Spicy ahi tuna: white rice, ahi tuna, takuwan, cucumbers, edamame, thin slices of pickled ginger, wasabi peas, sriracha, Mayo sauce. Crab burrito: nori, rice, crab, avocados, cucumber, carrots, orange tobiko, crispy tempura, black sesame seeds, mayonnaise. 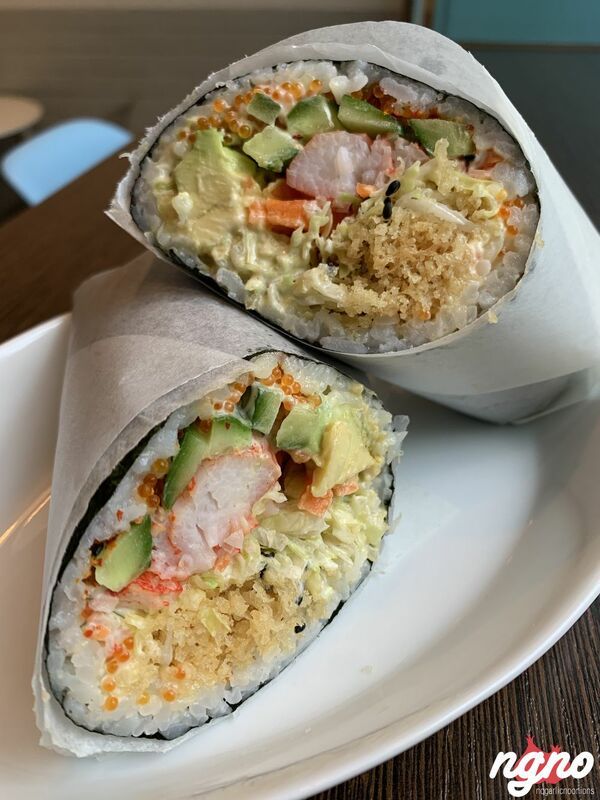 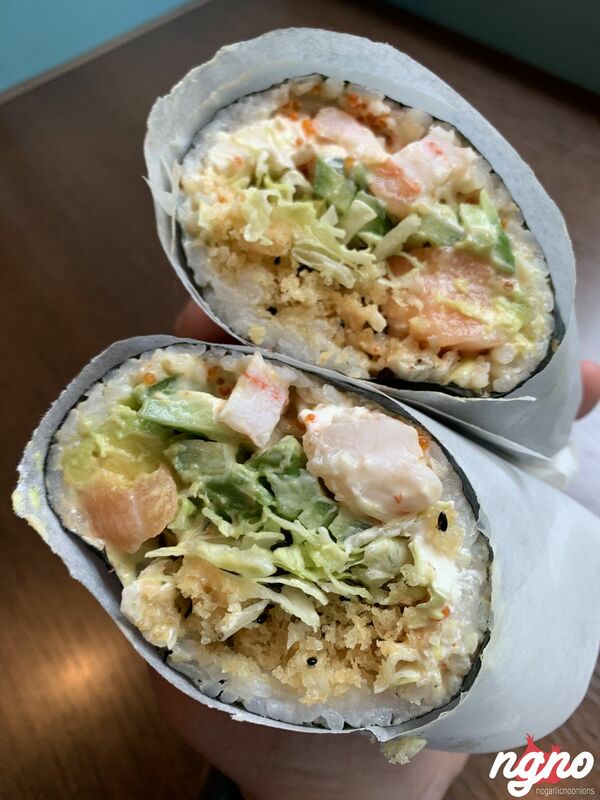 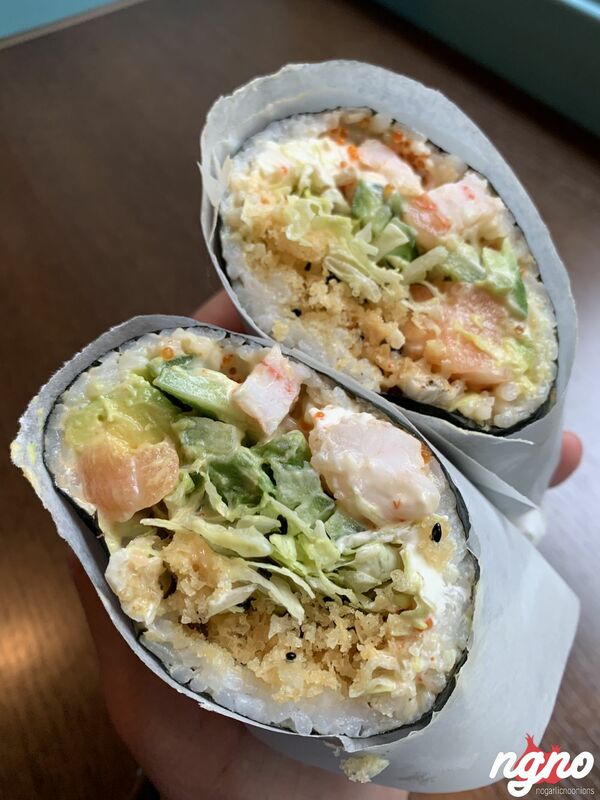 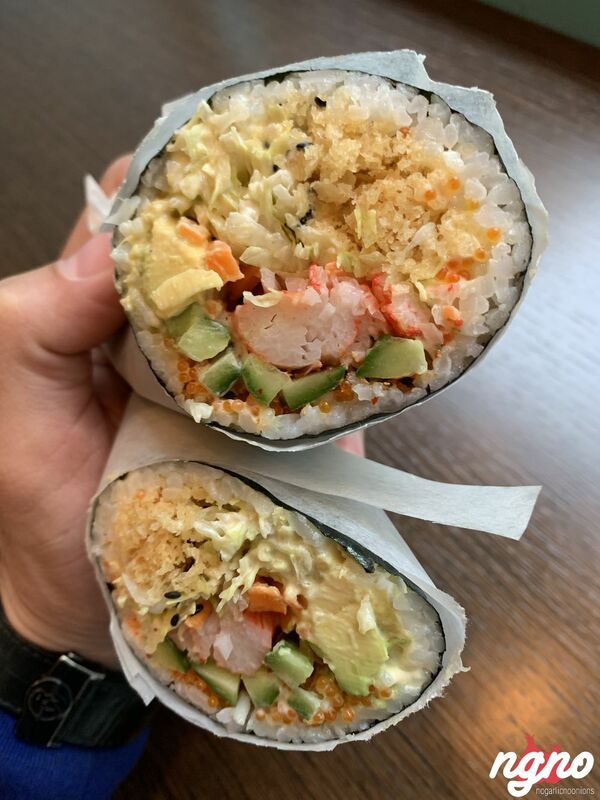 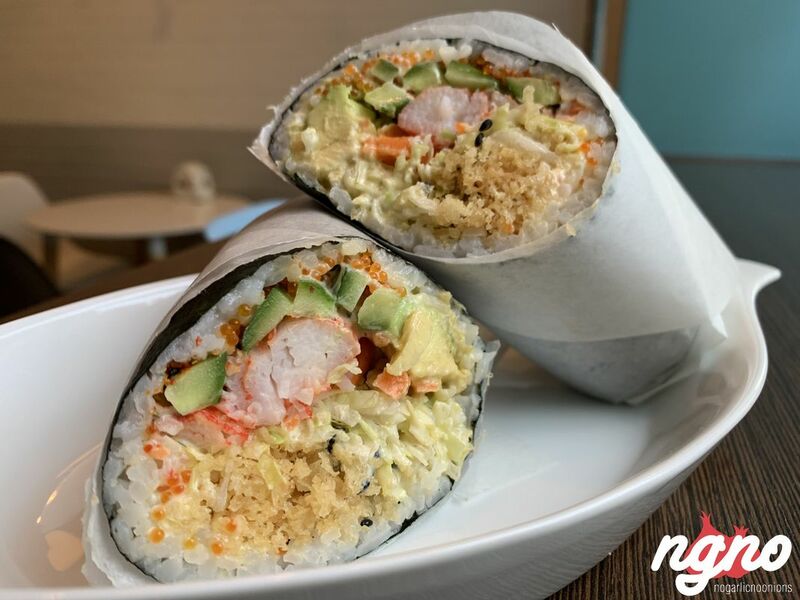 Spicy salmon burrito: nori, rice, Philadelphia, salmon, crab, shrimp, lettuce, avocado, cucumber, crispy tempura, orange tobiko, black sesame, house special spicy sauce. 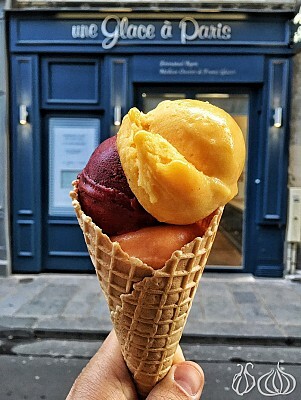 C’est très bon! 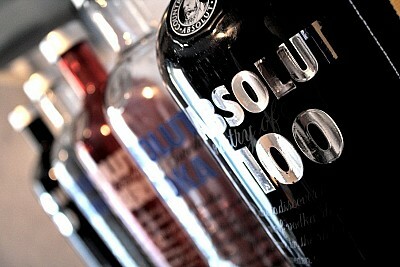 I shouted! 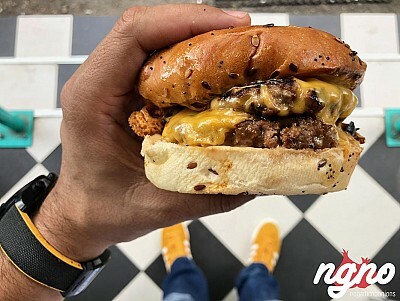 It’s so freaking tasty! 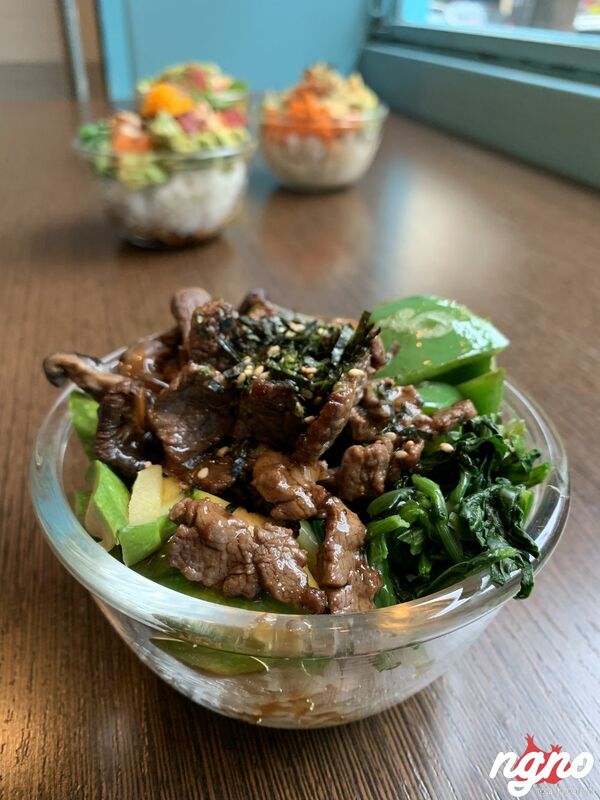 The superb rice and exceptional ingredients! 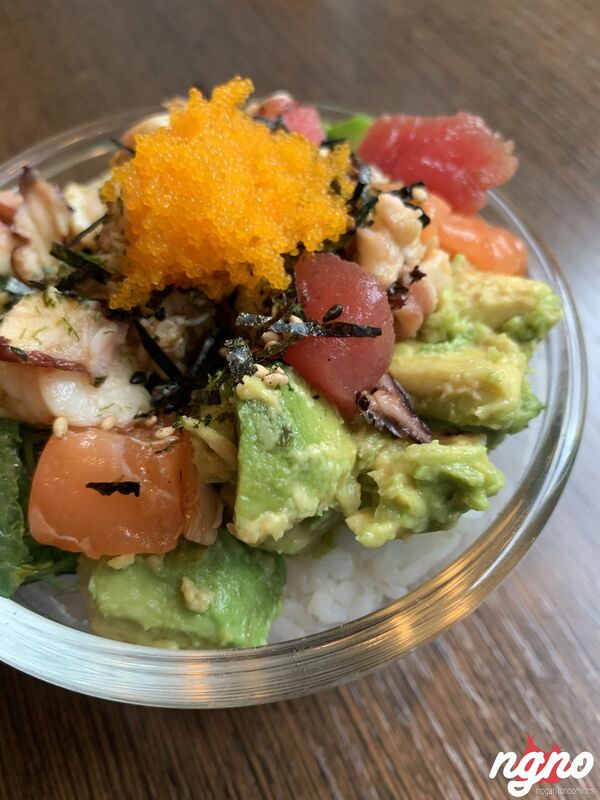 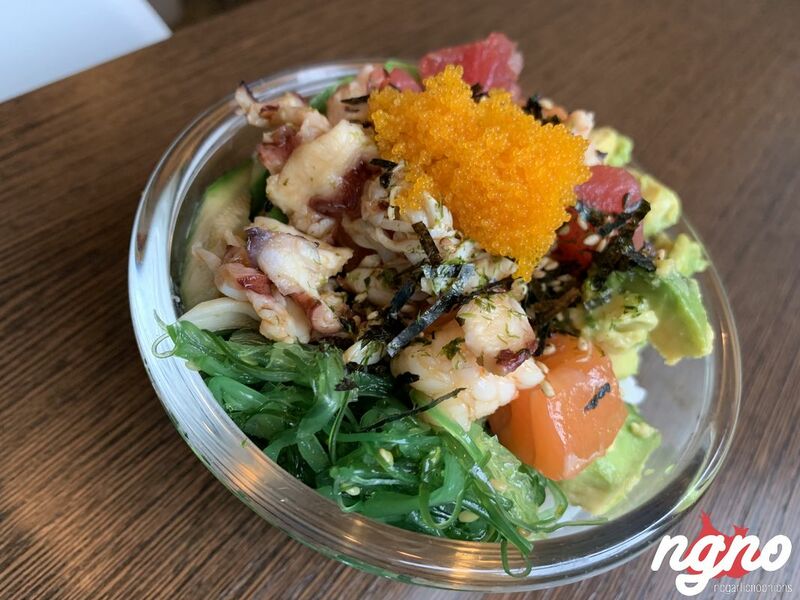 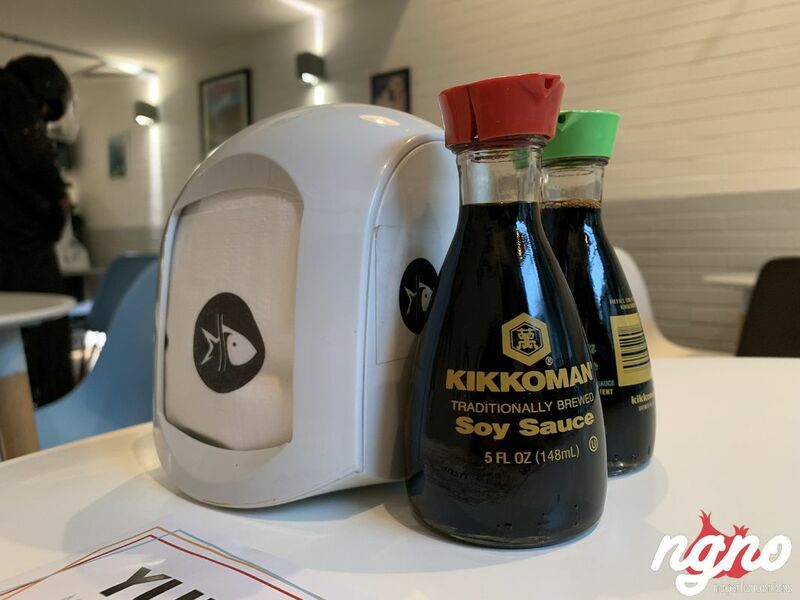 I loved the temperature of every bowl, the crunchy bits, the textures, the freshness of seafood, the rice perfect taste and size of salmon cubes among others. 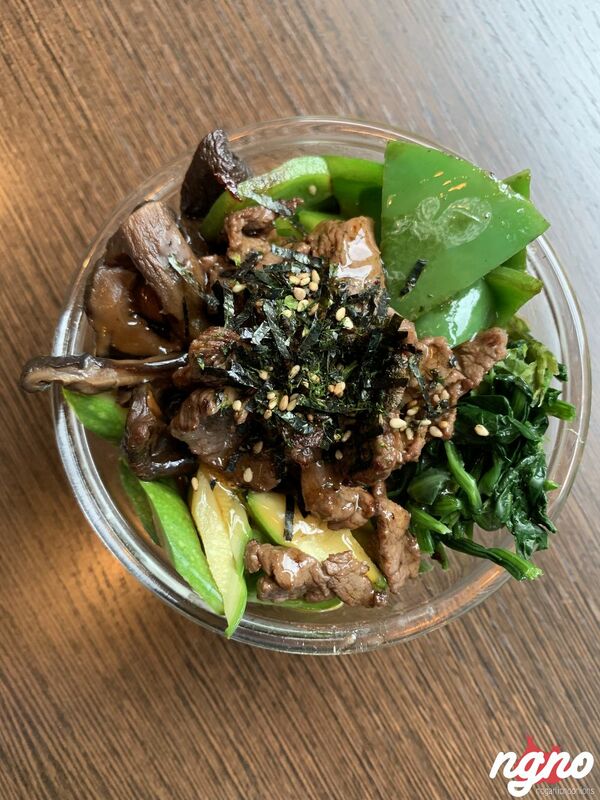 The most surprising is the beef which I recommend you to try because of the warm temperature it’s served at. 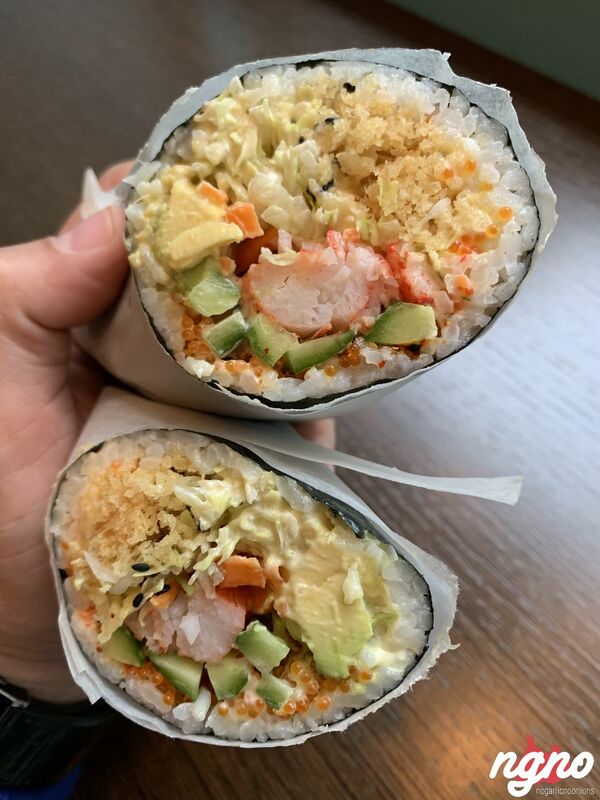 Because I’m in love with Ichiban’s sushi burritos, I’m hard to please! 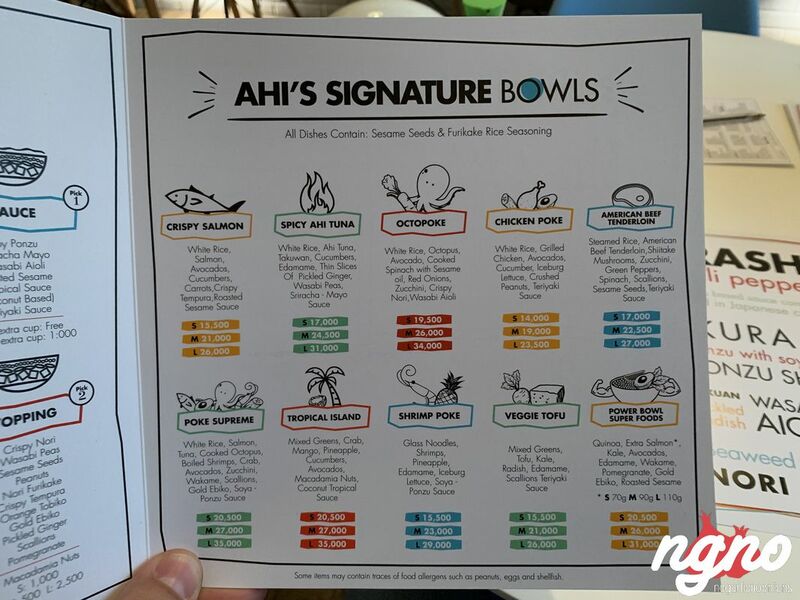 I was surprisingly and positively impressed by the taste, quality, simplicity, and lightness of Ahe Poke’s burritos. 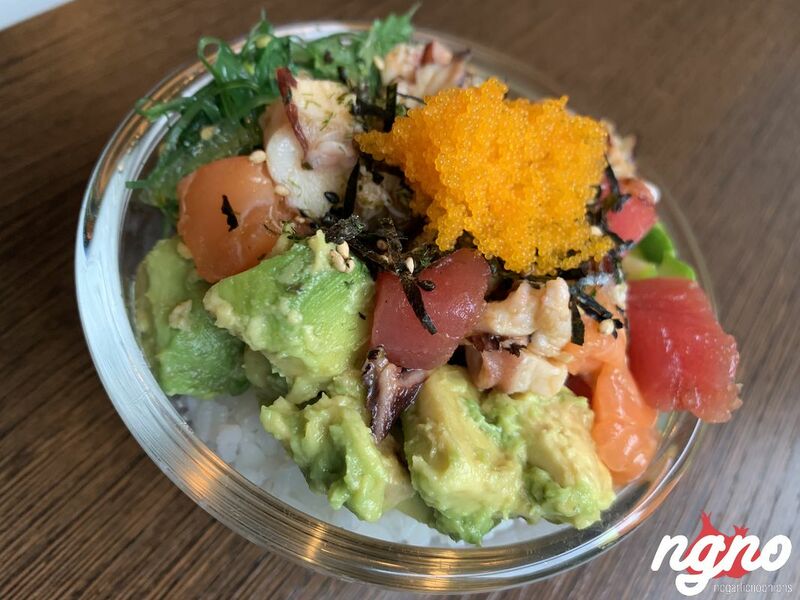 Every bite feels light and airy, crunchy crisps, fresh seafood and a cold refreshing sauce without being too sticky or too saucy.